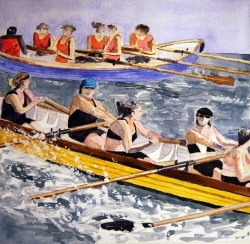 An impressionist watercolour painting of Moon, Stella, Helen Mary, Evelyn, and Mildred, racing at the mouth of the Fal estuary in Cornwall England. 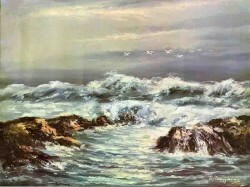 Painted by Nigel Reed in 2013. It is the working boats which have dredged the estuary for hundreds of years that inspired this painting. 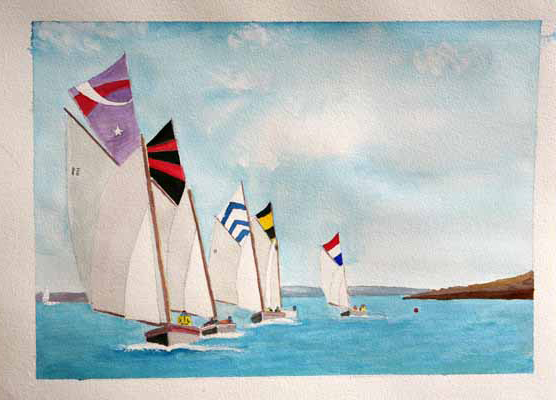 They sometimes hold races and show off their paces and their brightly coloured topsails.